With Relevant Tools web forms you can easily setup fields that can be used as counters so that each time the form is filled out the field will automatically be incremented from the last signup. 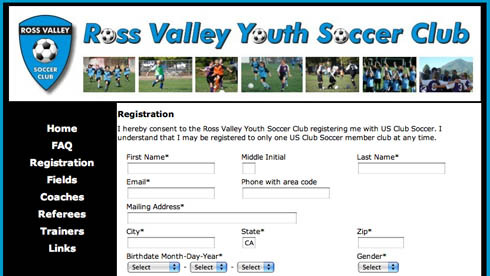 For example, if you are registering players for a youth sports league you can have a unique registration number that is automatically assigned to each player. To set this up you need to first define a field in your database to be used as the auto increment counter. The field type should be integer. You can name the field anything you would like. If you are registering customers for a conference you could name the field Customer Number. 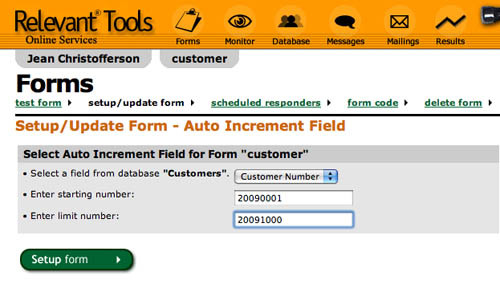 Then in the forms area select the form you want to add the auto increment field to and click on forms setup. Next click on the link “auto increment field”. 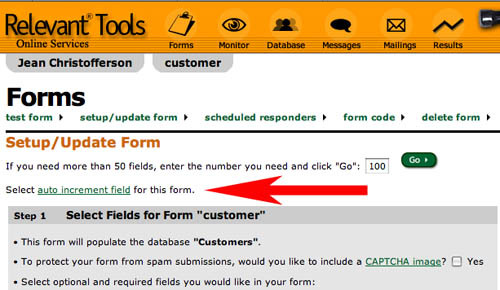 If you do not see the auto increment field link for your account on the forms setup page all you need to do is go to our contact page and request that the auto increment feature be turned on for your account. There is no additional cost for turning on or using the auto increment fields. Select the field that you want to use for the auto increment field. You can enter the starting number. If you do not enter a starting number it will start at one. You also have the option to enter a limit number. If you do not need to limit your form signups simply leave the limit number blank. A limit number is useful if you are registering customers for a conference or event and need to limit the number of registrations. Once the limit is reached anyone signing up will receive an error message that the event is full. On your error page you can have yet another Relevant Tools form to signup for the waiting list!